Creamy, delicious, vegan and high in protein. Doug and I haven't had dairy milk in over 25 years. And in the past 25 years we've tried every non-dairy milk on the market - Rice milk, soy milk, almond milk, cashew milk, oat milk, hemp milk, coconut milk and probably a few more I can't recall. I must admit, I love soy milk. I even have a soy milk maker and used to make my own from organic soy beans. And I adored the soy yogurt I was able to make in my Instant Pot. But then I found that my thyroid was a bit sluggish and my naturopath told me to avoid soy since it's a goitrogen and can interfere with the absorption of thyroid hormone. Other favorites were hemp milk, due to its omega-3 content, and almond milk, because of its taste and low calorie content. I also like to make my own almond milk, which is quite easy. Recently my friends Marcia and Bob introduced me to Ripple. 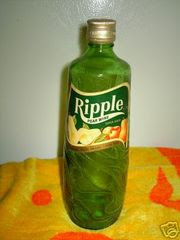 I laughed when I heard the name because in the late 1960's, when I was in college, Ripple was a cheap, fortified wine that was very popular. I once had a Ripple party and we managed to line the entire perimeter of my small studio apartment with empty Ripple bottles - I don't remember much else about the party so I probably had my share. 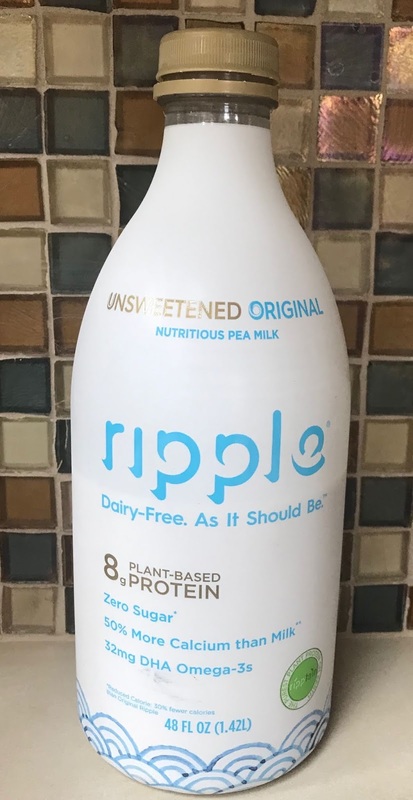 Ripple is made from peas. For me, it seems like it's the non-dairy milk most similar to the consistency and richness of soy milk. It's vegan, lactose free, nut free, soy free, and gluten free. Although it's not certified organic, it is GMO free. * It uses 98.5% less water than dairy milk and 96% less water than almond milk during manufacturing. * Although it's non-GMO, I wish it were organic. There's a big writeup in their FAQs that explains their reasoning. * I don't love that it contains omega-6 rich sunflower oil as I try to avoid these inflammatory oils. * Although some people like their non-dairy milk to have added calcium, I don't. 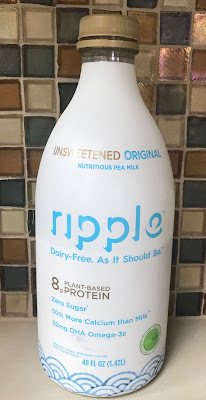 A cup of Ripple contains 450mg of calcium per cup and no magnesium. This is an issue for me for three reasons: First, that's a LOT of calcium - I think people take too much of it. Second, calcium should be balanced 2:1 with magnesium and this is not. Third, if you are taking thyroid medication, you cannot take a calcium supplement for at least 4 hours. 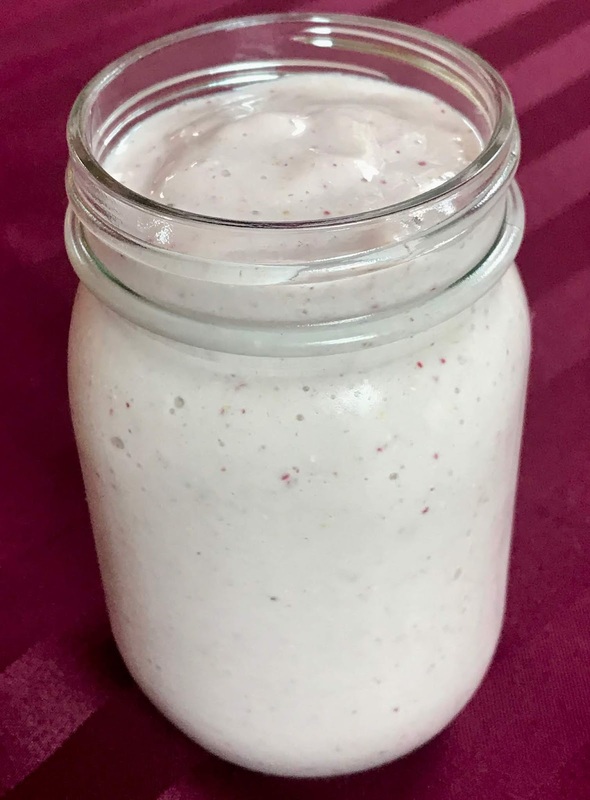 Since most people take their thyroid meds first thing in the morning, they will not be able to use Ripple or any other beverage that is heavily fortified with calcium in their morning smoothie or coffee. This is a bummer for me. All this said, I love this stuff. It makes an amazing smoothie (which I have in the afternoon) and a very creamy chia pudding. Place all the ingredients in a high speed blender and process until smooth. Serve immediately. Coarsely chop the dates and soak in the milk for 2 hours. Place the soaked dates, milk, cinnamon, vanilla and stevia in the blender. Blend until smooth. Pour the blended liquid in a 1-quart container. 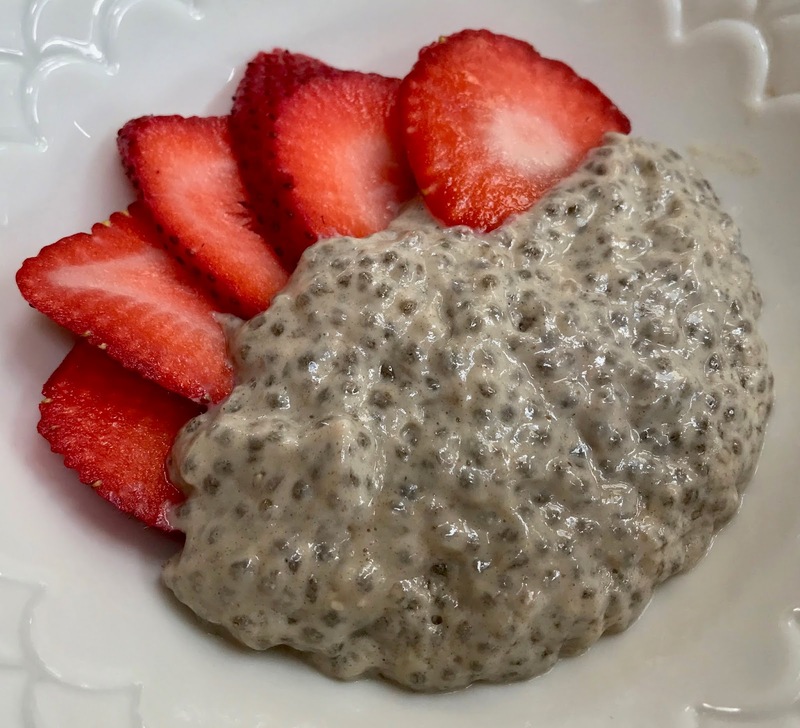 Stir in the chia seeds. Stir vigorously for 1 minute. Let the mixture sit for another 15 minutes and stir again vigorously until the chia seeds are well blended and separated. You may need to do this again a few times as the chia seeds have a tendency to clump. Cover the container and place in the refrigerator for at least 24 hours to allow the chia seeds to absorb the liquid. Serve alone or with fresh fruit. I love it with fresh strawberries or mango. Ripple comes in other flavors: Original, Vanilla, Unsweetened Vanilla, and Chocolate. You can make the smoothie or the chia pudding using any of these flavors. Romanesco is almost too beautiful to eat. I Instagrammed this picture last week and several of my east coast relatives asked, "what the heck is that?" 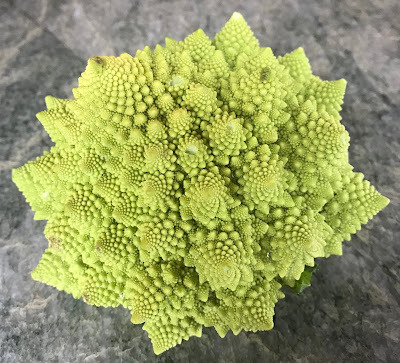 So I guess these gorgeous veggies aren't too common. Luckily, they are readily available in our local markets here in Sonoma county. Although people compare them mostly to cauliflower, their taste is far more delicate. For some reason, I've recently become obsessed with this tasty vegetable and have been preparing them at least twice a week for the past month - always roasting them with a drizzle of olive oil and a sprinkling of spices. So simple, yet incredibly flavorful with just the right amount of crunch. 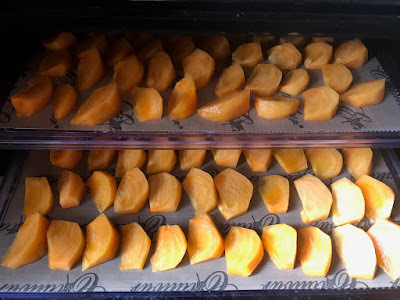 Heat the oven to 400 degrees F. Line a shallow baking pan with parchment. 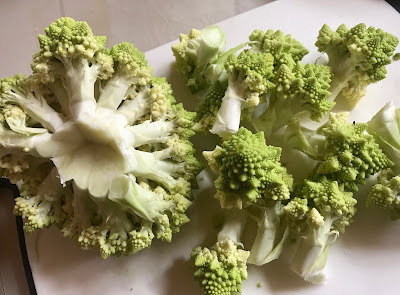 Break up the Romanesco into small pieces. Cut the larger pieces in half. Place on the pan and drizzle with olive oil. Toss until the pieces are coated evenly with the oil. Then, sprinkle salt, pepper, and garlic powder to taste. 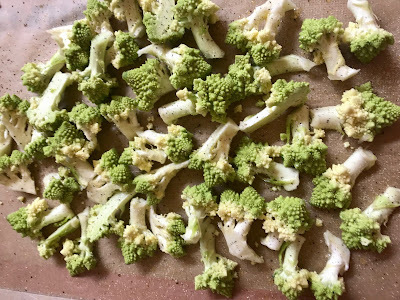 Roast in the oven for 30 to 35 minutes until browned and easily pierced with a fork. Stir midway through cooking. 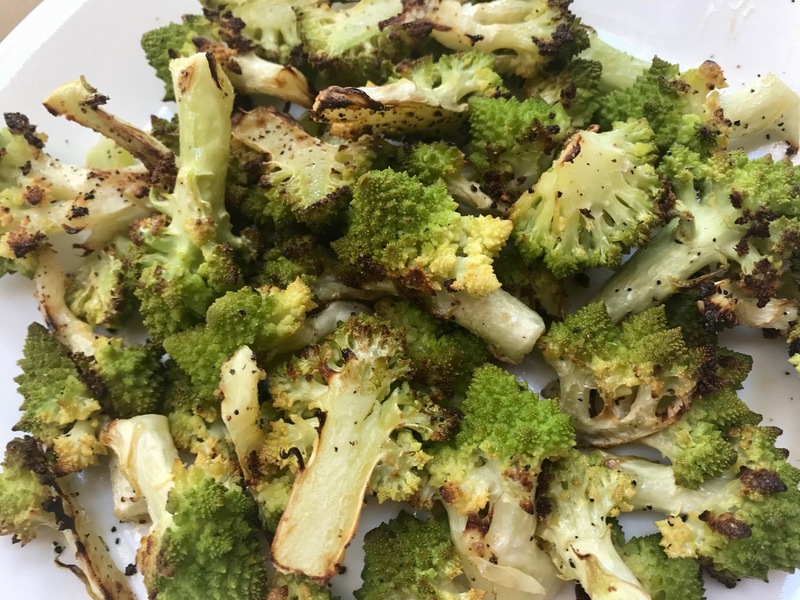 Remove from the oven and squeeze the wedge of lemon over the roasted Romanesco and serve immediately. 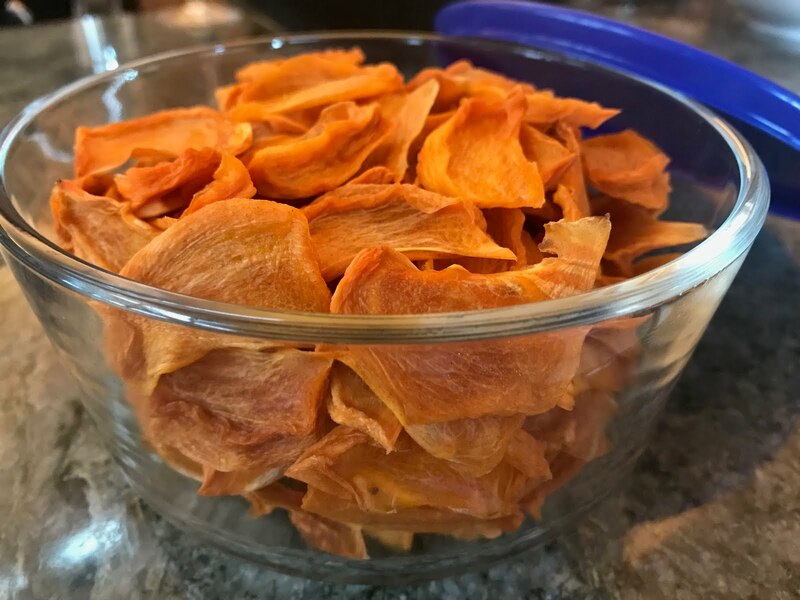 Dried persimmons make a great snack. 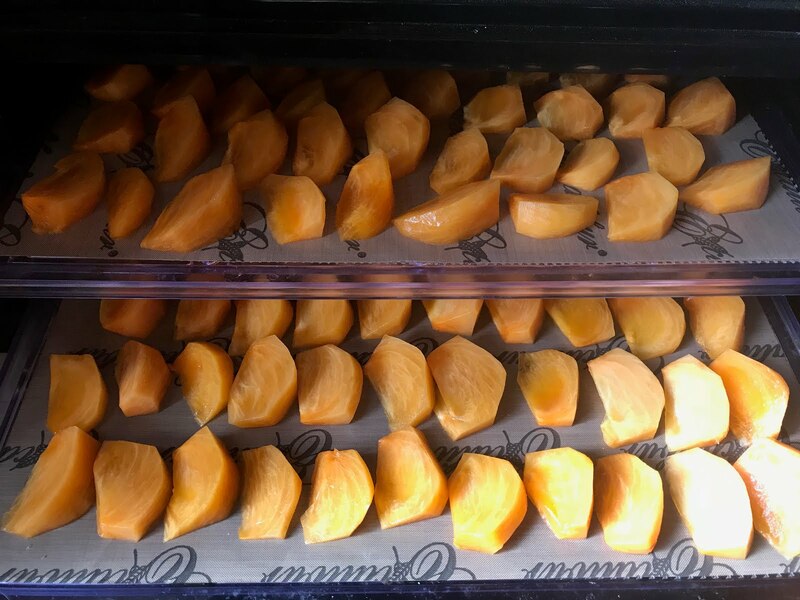 We have two Fuju persimmon trees and this year both of them really produced. 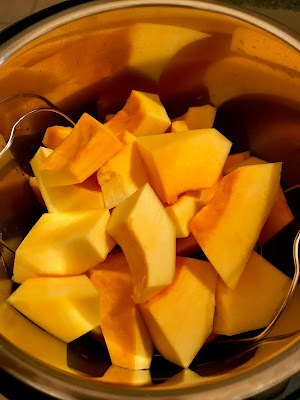 The thing I love about Fuju persimmons is that you can eat them firm, like an apple or pear. They aren't as good when they get too soft so when that happens, I dehydrate them. Dried persimmons make a wonderful snack. You can see that we had way too many to eat. And this is after we gave lots of them away! I like to peel mine but many people leave the skin on. 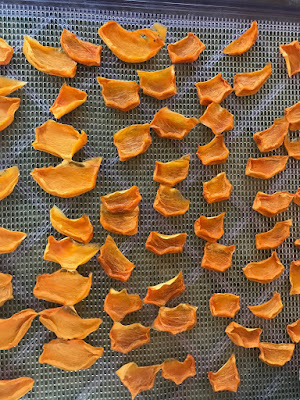 Place the peeled and sliced persimmons on the non-stick teflon dehydrator sheets. If you leave the skin on, you can just cut them horizontally in circles. I like mine peeled and cut into thin wedges as seen in the picture below. Spread the persimmons on your dehydrator's teflon sheets on the trays. Place the trays in your dehydrator. 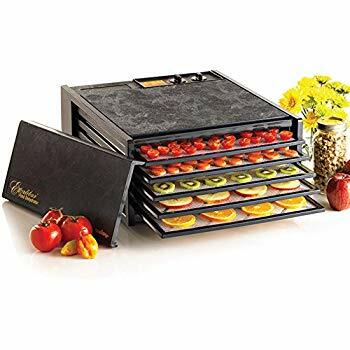 We have a 5-tray Excalibur Dehydrator which we really like. Dehydrating temperature will depend on what's important to you. 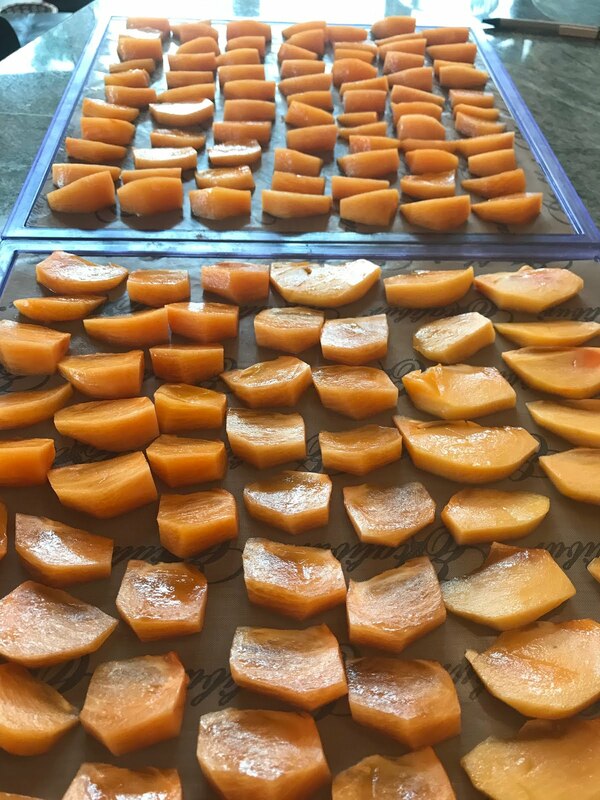 If you want them to be "raw", and retain their living enzymes, you can dehydrate them at 115 degrees F. This will take 24 hours. You can cut the time if you raise the temperature to 125 or higher. Dry at 115 to 125 until they are somewhat dry on top and start to pull up from the teflon sheets (about 10 hours). 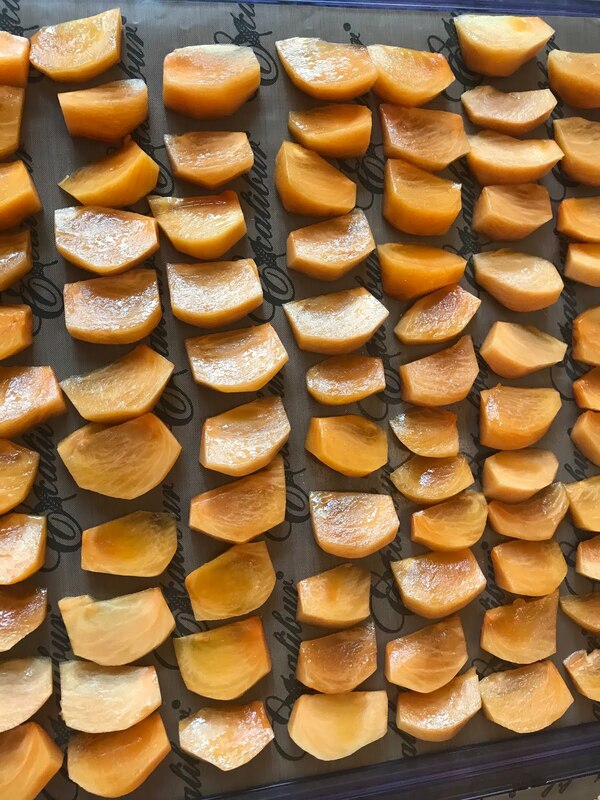 At that point, turn them over, remove the teflon sheets and place the persimmons directly on the mesh sheets. Dry another 10 to 12 hours until they are dry but still a bit pliable. Remove when dry but still a bit pliable. 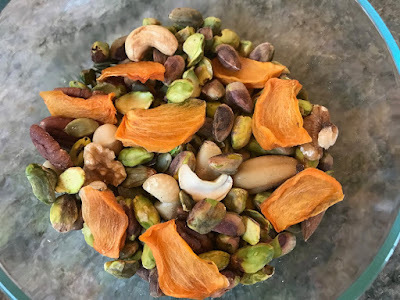 Serve with an assortment of nuts when guests come. Or put this nut/fruit assortment in your kid's lunchbox or take to work as a midday snack! Sweetened By Dates, No Sugar! Lighten up your Thanksgiving with only 135 calories of Yum. 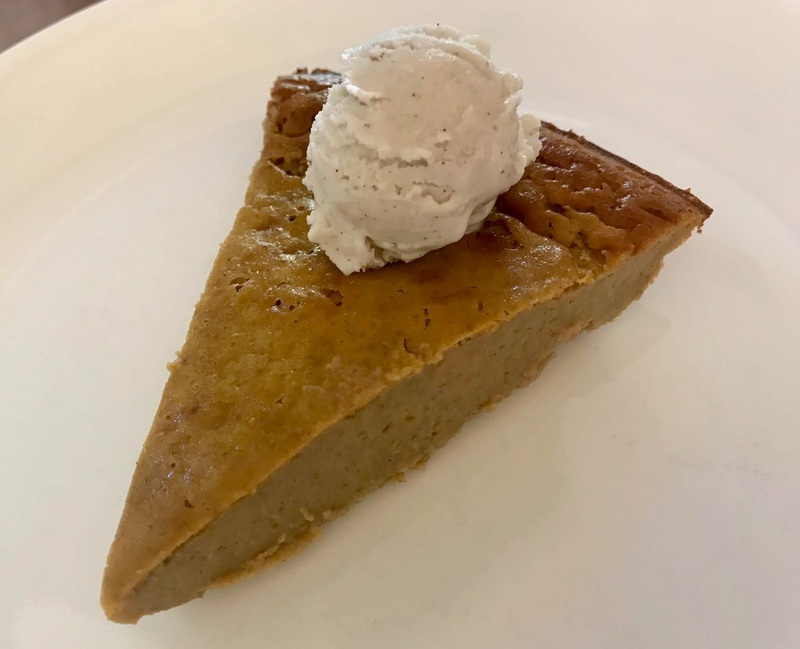 Having to give up gluten and dairy is really tough around the holidays, especially at dessert time. This recipe accommodates gluten-free, dairy-free, and sugar-free diets without compromising taste in the slightest. It does, however, contain eggs so it's not appropriate for your vegan guests. Besides being incredibly low in calories, (weighing in at only 135 calories per serving, less than half of traditional pumpkin pie), it's super easy to make. 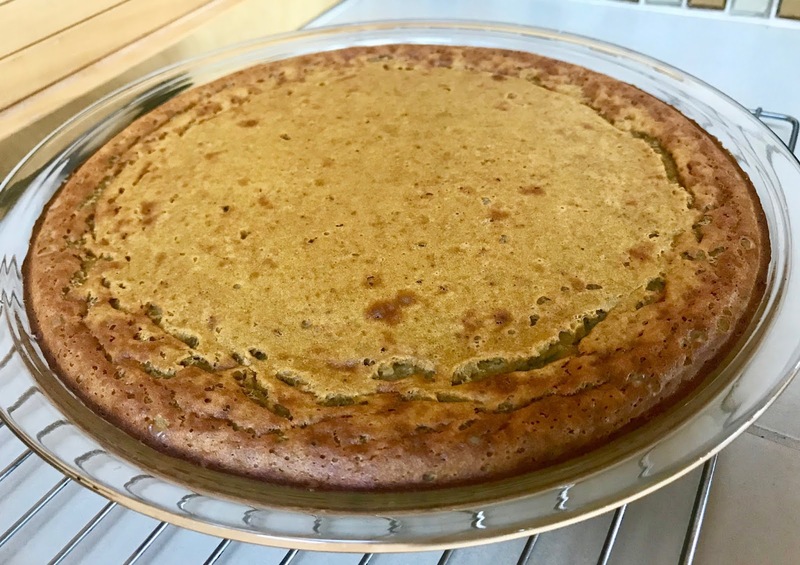 This recipe starts with home-grown pumpkin cooked in an instant pot, but you can also make it with a can of pumpkin. We grew a few dozen Racer pumpkins (in the front) which are good for Halloween. Doug drove around with them in the back of his truck and gave them to the neighborhood kids. This is my favorite. It's a Musque de Provence. It's so beautiful. 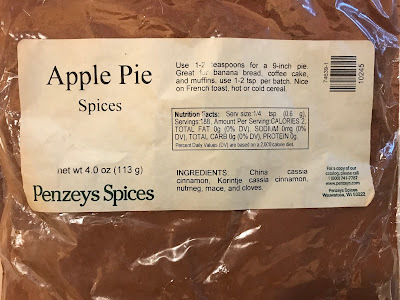 I also use this one for soup and pie. 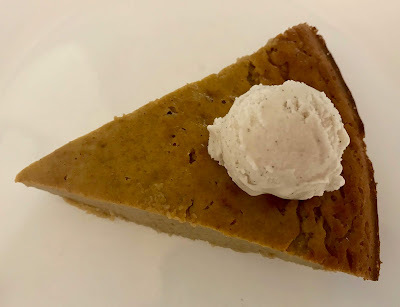 When you use fresh pumpkin for your pies, the most important thing is to make sure it's not watery. So after cooking it, whether it be in your Instant Pot or steaming it on the stovetop, make sure it's well drained. You're going to need 2 cups of mashed pumpkin, so start with a pumpkin big enough to do that - about 3 to 4 pounds. This will vary with the density of the pumpkin you are using. The pumpkins I use, pictured above, weigh over 10 pounds so I just cut out a wedge and save the rest for soup or more pie. 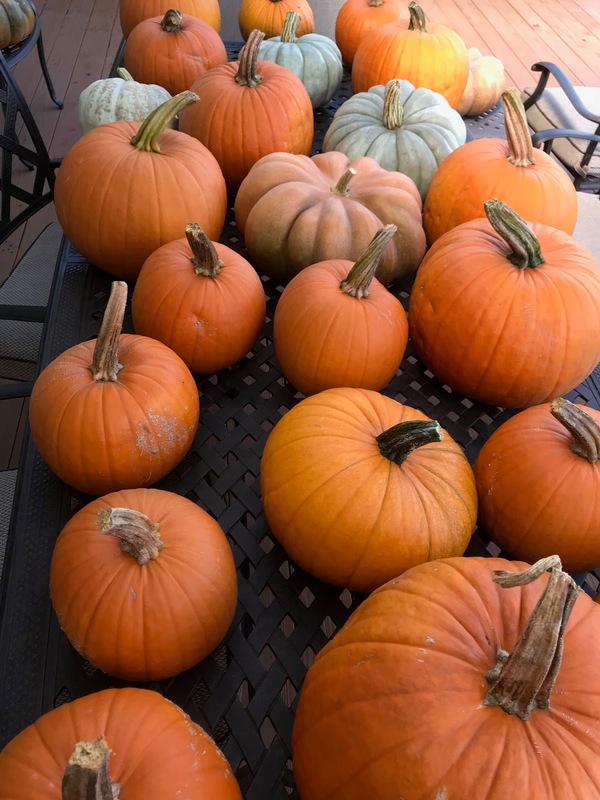 Peel and cube your pumpkin and put it in a steamer basket in your Instant Pot with a cup of water. Cook at high pressure for 5 minutes with a quick release. It should be fork tender. If not, continue to cook. 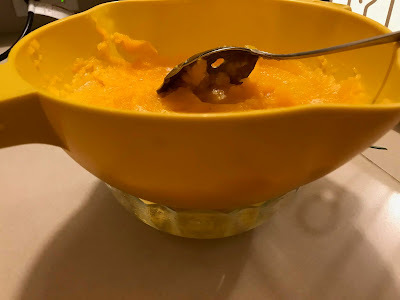 Scoop the cooked pumpkin into a colander with fine holes. Let it drain until it's very dry. You can help it along by mashing it down gently with a fork or spoon. Pumpkin draining in a colander over a bowl. When it stops draining, it's ready to use in the pie. Measure out 2 cups of mashed, drained pumpkin and set aside. You can easily roast your pumpkin by cutting it in half, putting it on a shallow roasting pan or on a baking sheet lined with parchment, and baking it at 375 degrees F until tender. I like to loosely tent it with aluminum foil. 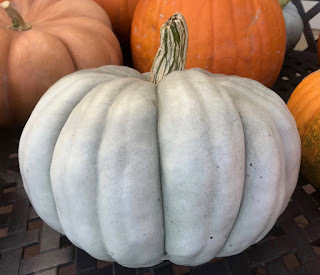 The time will vary with the size of the pumpkin but it cab take 1 to 2 hours or more. 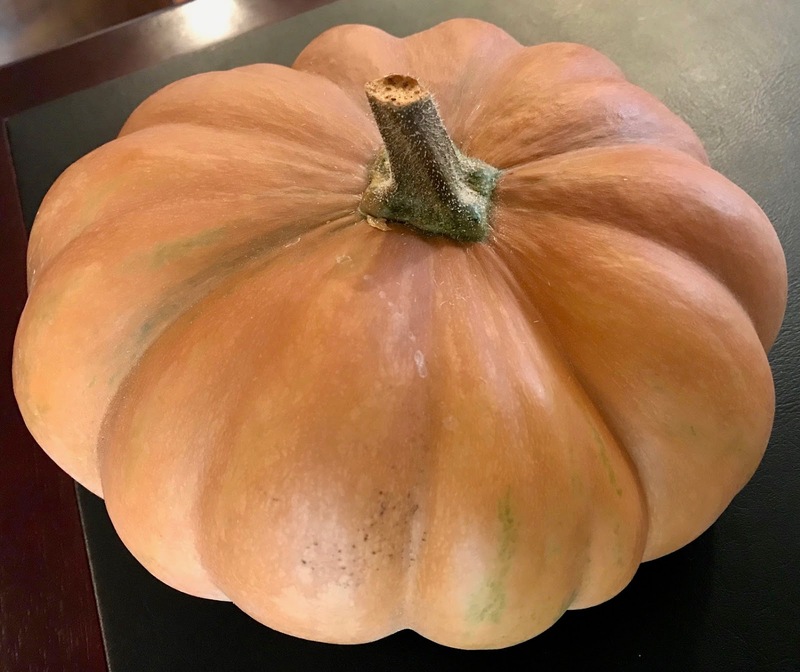 The advantage is that it results in a much drier pumpkin than one that is steamed but the disadvantage is the time it takes to cook. You will still have to drain it in a colander to remove any moisture. Most recipes call for more nutmeg and less ginger but I like ginger much more than I like nutmeg. So change the ratios to suite your taste. Mix them all up and store in a spice jar in a cool, dark cabinet. It will last a long time. * Dates can be replaced with 1/2 cup sugar, but dates are healthier and contain dietary fiber and other nutrients. Preheat the oven to 375 degrees F. Grease a 10-inch pie pan and set aside. Pit the dates and coarsely chop. Pour the coconut milk in a small bowl with the chopped dates and let soak until they soften. If the dates are soft and fresh, this won't take long. If they are hard, it may take several hours. Place the coconut milk and soaked dates in a blender and blend until well incorporated. Add the remaining ingredients and process until smooth, about 20 seconds. Pour into the prepared pan. Gently tap the pan on the counter to remove air bubbles. 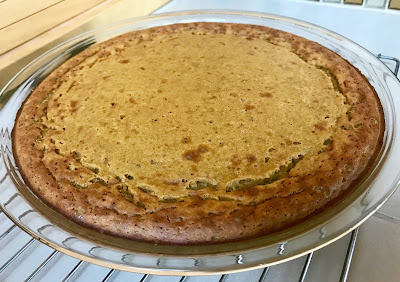 Bake in the preheated oven for 45 to 50 minutes or until the pie barely jiggles in the middle, is set all the way through, and is brown around the edges. Remove from the oven (test with a toothpick which should come out clean), and place on a wire rack until cooled completely. Place in the refrigerator to chill before serving. Serve as is or with a tiny scoop of non-dairy vanilla ice cream. Per serving: 135 calories, 6 g fat, 3 g saturated fat, 4 g protein, 18 g carbohydrates, 2 g dietary fiber, and 183 mg sodium. 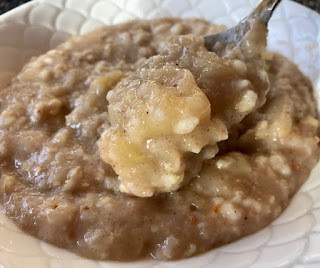 This yummy oatmeal takes little effort in your Instant Pot. When the temperature drops, my desire for cold smoothies wanes and I want a nice warm breakfast. I actually prefer eating a more lunch-like meal in the morning, such as a sweet potato and greens or a quinoa bowl. But when we are in a hurry and want something soothing, we turn to oatmeal. 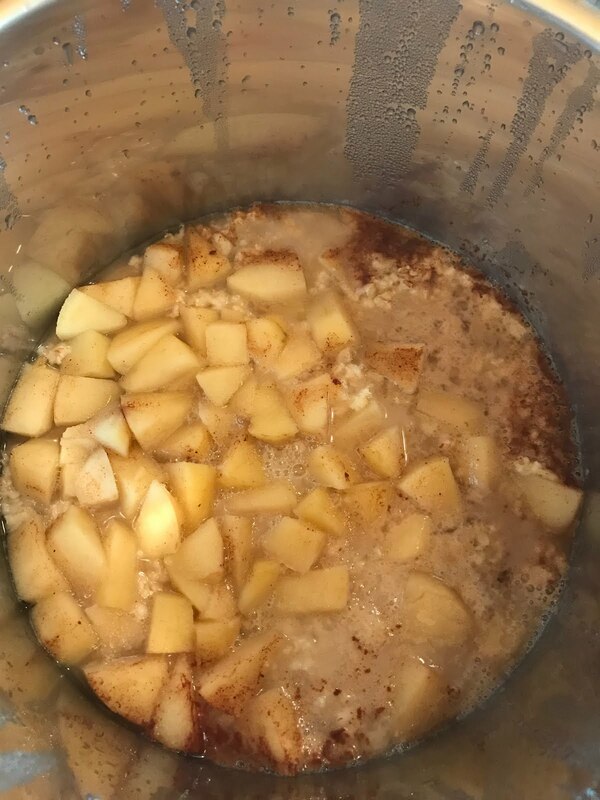 This is one of our favorite ways to make Instant Pot oatmeal - especially in the fall when we still have a refrigerator packed with apples from our Fuji apple tree. And it's pretty perfect for our dairy and gluten-free diet. We use this blend in muffins, crisps, on French toast, and more. 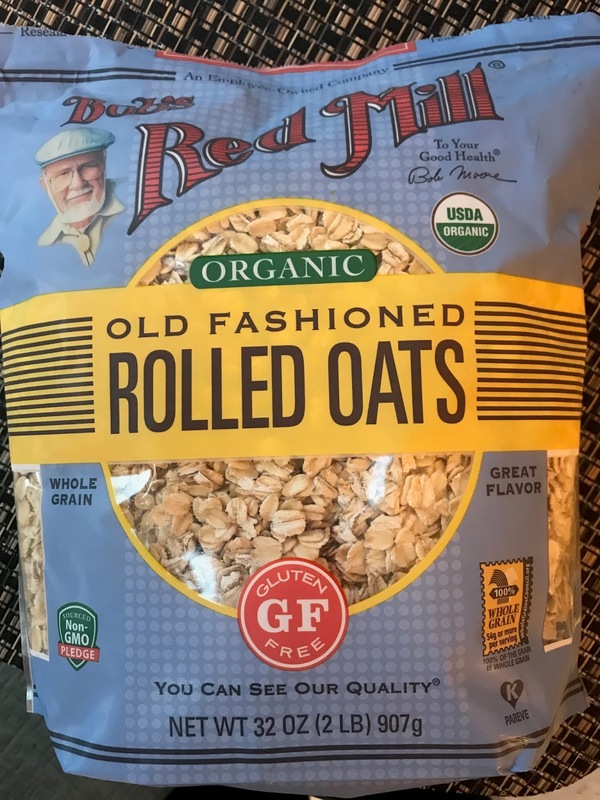 Oatmeal is naturally gluten free but often the oats are contaminated during transportation or in the processing plant. For most people who may be somewhat gluten sensitive, it might be ok to just buy regular rolled oats. But if you are highly sensitive to gluten, or have Celiac disease, you should buy certified gluten free oats. We buy Bob'a Redmill Organic Gluten Free Old Fashioned Rolled Oats. Place all ingredients in the Instant Pot and stir to mix. Secure the lid, making sure the vent is closed. Press "Manual" and set for 4 minutes at high pressure. When done, press "Off" and let the pressure release naturally. Remove the lid carefully, stir well and serve. After the pressure comes down, it will look like this. Per serving: 141 calories, 2 g total fat, 34 mg omega-3 and 685 mg omega-6 fatty acids, 0 g saturated fat, 0 g cholesterol, 4 g protein, 28 g carbohydrates, 4 g dietary fiber and 147 mg sodium. Tired, Gaining Weight, Cold, Forgetful? You May Have Hypothyroidism? Why Normal TSH Numbers May Not Be Normal! Millions suffer from a mild thyroid disorder but go untreated. I am not an endocrinologist so this post is really just about my story. But before I begin, let me speak a bit about how my doctors approached the same problem. I have two primary physicians. One is a talented board certified doctor trained in a traditional medical school. My visits to her are generally covered by Medicare and normal insurance. The other physician I use is an Integrated Practitioner. Not only is she a board certified doctor, she is a trained herbalist and takes a holistic approach to diagnosis and treatment. Insurance won't pay a penny of my visits to her. I find it very interesting on how differently the two doctors approach things. I typically listen to both and decide what I want to do but most often, I listen to my Integrated Practitioner. My thyroid is a perfect example. Your thyroid releases thyroid hormone as a result of the pituitary gland releasing thyroid stimulating hormone, or TSH. When the body doesn't respond sufficiently to the increase in TSH and cannot release more thyroid hormone, this is called hypothyroidism. My allopathic doctor said "your thyroid is normal". We can consider subclinical treatment at some point. Let's keep an eye on it. * Tested for thyroid antibodies to make sure I didn't have an autoimmune thyroid disease (Hashimoto's thyroiditis) or celiac. (These tests were for thyroid peroxidase (TPO) Ab, and thyroglobulin antibody.) Both tested normal. * We also tested for Free T4, Free T3, Reverse T3 to further evaluate the reason for high TSH. * She wanted to rule out gluten sensitivity and didn't think the blood test results were very accurate, so she ordered a more accurate gluten sensitivity stool test from EnteroLab. Sure enough, I have an active dietary gluten sensitivity and must now be on a strict and lifelong gluten free diet. * She ordered a test for iodine which came out a bit low so she had me take a seaweed supplement. * Other supplements she had me try were L-tyrosine and forskolin. I retook my TSH, Free T4 and Free T3 after a few months of eating gluten free, and taking supplements but unfortunately none helped lower my TSH, although some of my symptoms improved from removing gluten but not all of them. So we finally agreed it was time for me to take thyroid medication. A dear friend who is a naturopath and also has thyroid disease advised me to take Armour, which offers both T4 and T3, as opposed to some of the synthetic medications such as Levothyroxine, a synthetic form of T4. I started on a super low dose (15mg), and will need to be retested 6 weeks from when I started taking it. Almost immediately, after starting the low dose thyroid hormone, my afternoon fatigue went away. I also think my mild brain fog is lifting. I'm still waiting to see more results, but it's only been two weeks and I might need a higher dosage after I get retested. The point of the story, is that the TSH reference range is still controversial. The National Academy of Clinical Biochemistry recommended reducing the reference range of TSH levels in 2002. This led to the American Association of Clinical Endocrinologists to recommend that doctors consider treating patients who fall between the TSH level of 0.3 to 3.0 instead of the range 0.5 to 4.5/5.0 (where it still remains today.) If that guideline was changed, it would have expanded the number of thyroid patients from 15 million to a total of around 60 million Americans, most of whom would fall in the underactive hypothyroid category. Do I think 60 million Americans should be on thyroid meds? It depends on they feel. I would have gladly ignored the high TSH number, given my other doctor said it was "normal", had I not had so many other symptoms. So when your doctor says your test results are "normal", for whatever test you are taking, get the exact numbers and do your own research. And if you have symptoms, make sure your doctor is well aware of them and not just diagnosing you based on standard test results and reference ranges. If you can afford to visit a practice that embraces Integrative Medicine or Functional Medicine, both of whom treat the whole person, not just the disease or the "numbers", do so. Some of these doctors do take insurance, but unfortunately not all. This was a huge decision for me as I've been very proud to say I'm 70 and don't take a single medication. But it's a hormone, like vitamin D is a hormone - and I'm happy to take something that can prevent some of the many age-related issues that come along around now. Last week I picked all of my delicata. I had a pretty good yield - about 15 per plant using Doug's famous magic dirt formula. 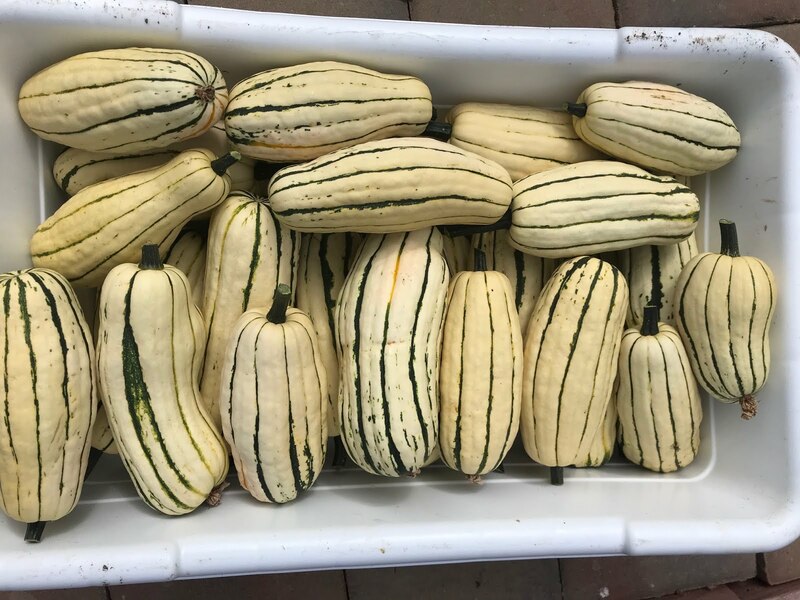 Since delicata squash do not store as long as some of the other winter squash, we've been eating them in lots of different ways. 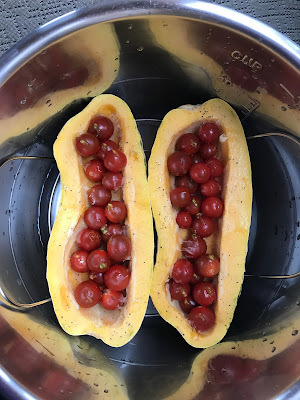 Last night we enjoyed them in the Instant Pot stuffed with the cherry tomatoes from our garden. In order to fit in a 6 quart Instant Pot, use a delicata squash that is no longer than 7 inches. 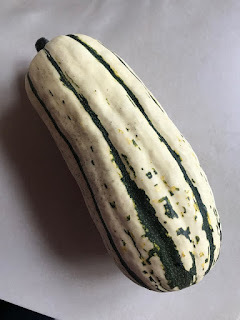 Cut the stem off the squash. 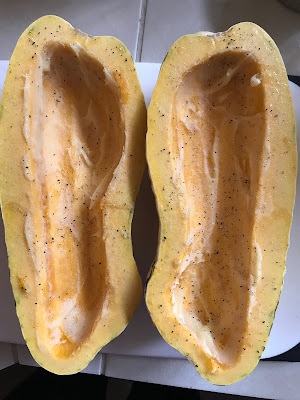 Then, cut vertically in half and remove all the seeds. Butter generously with Miyoko vegan butter or ghee. Sprinkle with salt, pepper, and garlic powder to taste. Place a steamer basket into the Instant Pot (make sure it's one with handles) along with 1 1/2 cups of water. Place the delicata onto the steamer basket and fill each side with 1/2 cup of cherry tomatoes. Pierce the skin of each tomato with a sharp knife. Secure the lid and set the Instant Pot for 8 minutes at high pressure. When done, immediately release the pressure and open the lid carefully. It may take longer but you should check to see if they are ready after 8 minutes by gently piercing the skin of the squash with a fork. If it's not ready, cook another 2 minutes and check again for doneness. When done, carefully remove the steamer basket from the Instant Pot and place each squash on a plate. 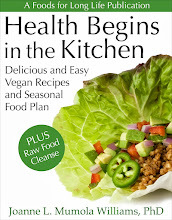 I like to top with the vegan parm that's in my eBook, Health Begins in the Kitchen. It's a mixture of chopped walnuts, brazil nuts, nutritional yeast, salt, garlic, and parsley. 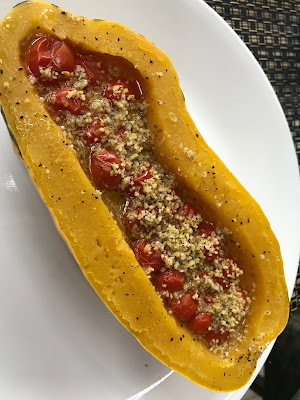 The Creamiest Polenta I've Ever Eaten!